This is the first in a series of posts we will be running over the next few weeks to help with choosing, installing and maintaining a deck in your garden. In this post we will be giving a brief rundown of the main types of decking available as well as some of the main positives and negatives of each. This is an economical option and approximately 75% of all new decking projects are completed using this timber. 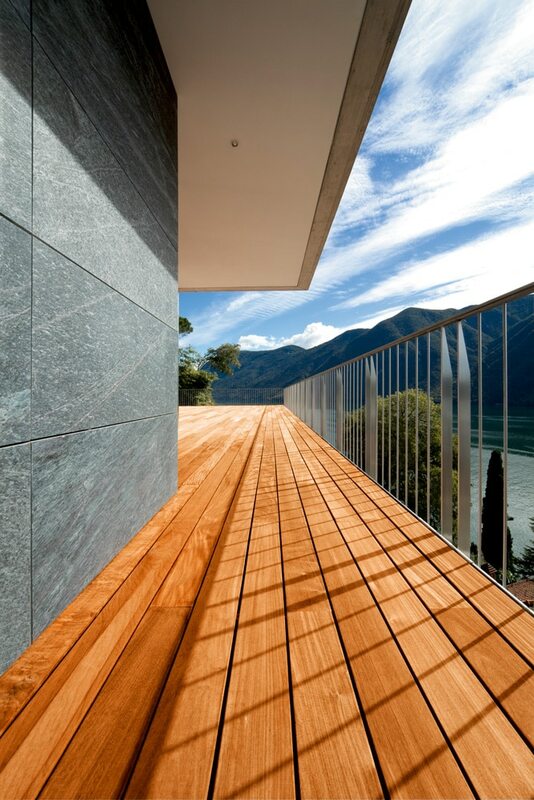 The main benefits of this type of decking are its affordability and ease of availability as well as its ease of use. It’s ordinarily made using pine which is then treated to guard against rot, fungus and wood-boring insects. 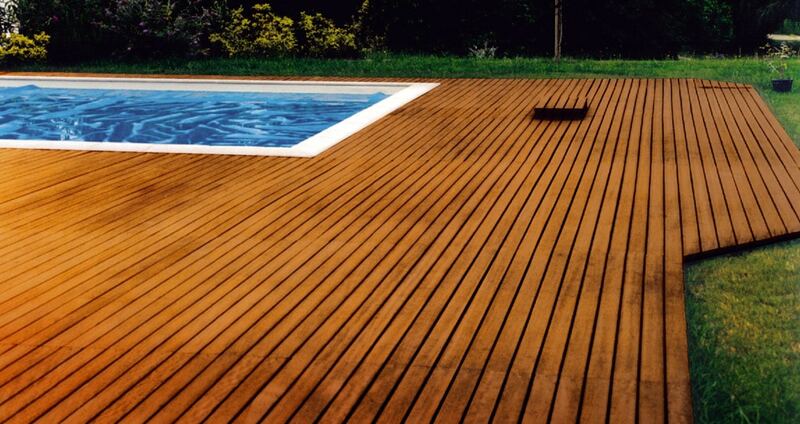 This timber has the characteristic green tinge and is widely used for decking throughout the world. The main downside to using pressure-treated softwood decking is it’s durability. They require more effort in preserving and protecting and are susceptible to splitting, cracking and warping. It will require annual cleaning and preserving to prolong its life but if well looked after can last for years. Both of these species of softwood naturally contain tannins and oils to help prevent rot, decay and attacks from insects. They also give a more natural finish as they are not filled with chemicals – and they have a rich and natural look too. They are up to 3 times more expensive than the pressure treated timber alternative. However, they give a more aesthetic finish and require less maintenance. A redwood or Cedar deck will typically only need to have a protective finish applied every 3 years or so. Another thing to consider when buying softwood decking such as this is the quality of the wood in relation to where is grew on the tree. The wood in the heart of the tree (called the heartwood) contains more tannins and oils and as such has more longevity. The wood towards the outside of the tree (called the sapwood) is softer and contains less of these oils so it is more susceptible to rot and decay. You need to ensure the quality of the wood you are purchasing. There are many species of hardwoods which are used to make boards for decking including oak, IPE, mahogany, massaranduba and cumaru. These woods are incredibly hard and strong and are naturally resistant to rot, fungus and insect attack. This means they require considerably less maintenance in order to keep them protected from the elements. However, as a result of them being so hard they can be difficult to work with – especially cutting and drilling! It can be near to impossible to screw into or drive in a nail without drilling a pilot hole. Because of this, many hardwood decks are installed using hidden clips and fastenings which add to the cost. Hardwood decking is definitely a more expensive option than pressure treated timber but it is broadly comparable in price to redwood or cedar. You will also need to protect your deck with a protective finish designed specifically for hardwoods which are more difficult to penetrate – such as Owatrol’s Textrol or Deks Olje D1. Composite wood is a rapidly expanding market and composite decking is beginning to show itself as a viable alternative. It’s primarily made from a mixture of wood particles and plastic. This creates a wonderfully rain and weather resistant material which won’t split, crack or splinter. Some companies also manufacture pure plastic decking so this could be an alternative for you. However, it just won’t look like wood, there’s no two ways about it. The look is just not as beautiful and natural as that given by a real wood deck. This might not be a problem for you and if not that’s fantastic because a composite deck requires very little maintenance and protection. In fact, all you’ll ever really need to buy is a cleaner and a reviver – just like Owatrol’s Compo-Clean and Compo-Care. Cleaning your composite deck is still particularly important though as they can be susceptible to mould and mildew, particularly in damp and shady spots. 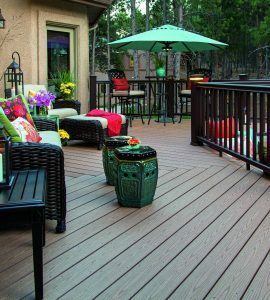 Composite wood decking also has the benefit of being available in a variety of colors so no finishing is required. The companies which manufacture it also often manufacture balustrades, mouldings and railings to match. One thing to be aware of is that like timber decking, composite decking does swell as it gets wet. However, unlike timber decking it does this along its length as well as its width. This is something to bear in mind if your deck will be slotting in between fixed structures! Metal decking, most commonly aluminum has a lot of things going for it. It’s strong and lightweight and it’s not prone to the typical damage that we see in timber. It can still be cut easily and the boards slot together tightly creating a water-tight deck with channels to drain away rain water. This makes it great for a raised or second level deck where people may be walking or sitting below! In addition, aluminium decking pretty much lasts forever, it won’t peel or blister and its powder-coated finish doesn’t require treating. But, and it’s a big but – it’s really quite expensive! Also, it just doesn’t quite look the same. For us a deck is a big part of your garden space. Part of its impact is its natural beauty and the way it can just sit in the environment. An aluminium deck doesn’t do this. If you’re looking for a statement piece then this might be it but be prepared for a pretty bank-breaking quotation! Hopefully that’s given a pretty good low down on the available options! 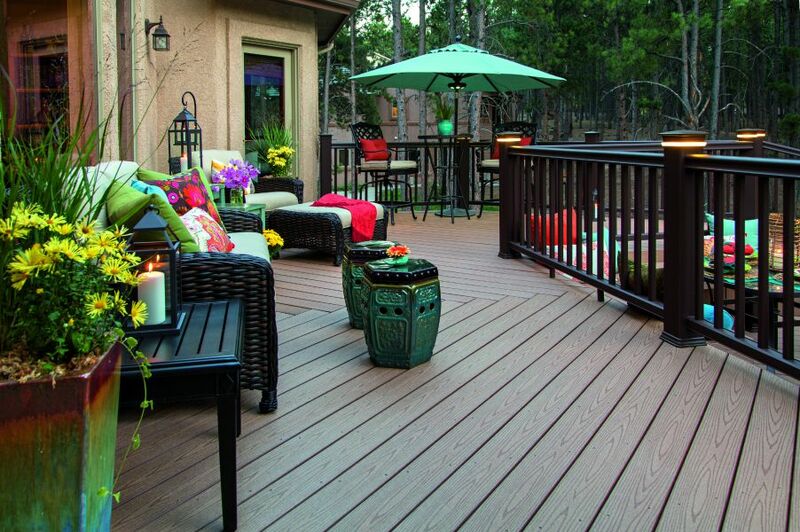 It’s great to learn about the different kinds of decking. For me, the hardwood deck sounds like the best choice. I love that it doesn’t take a lot of maintenance, and is naturally resistant to rot and things. We want to put in a deck, so I’ll have to look into this some more.